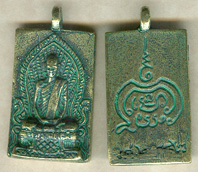 Metal amulet. Approx. 12mm x 23mm (26mm w/bail) x 6mm. Made in Thailand. Patina applied in US. Click here for larger image.